"Metadata for Data: Data Management"
Leveraging the DataLogger for Metadata Cataloging establishes a singular view of the meaningful attributes for your data and identifies access rights to this data. Data in Science Technologies is proposing the concept of a central Data Catalog called DataLogger, analyzes identified data sets and extracts the metadata into a searchable catalog. 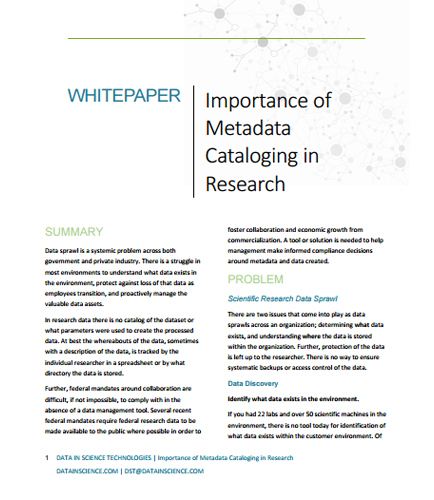 Read this informative whitepaper to learn more about how Metadata cataloging helps management make informed compliance decisions around Metadata and data created. What are the features provided by DataLogger when it augments with HPC and analytics systems? How does DataLogger help in solving the Data Management issues? How does Data Logging work? What are the research facilities provided by the DataLogger? How research data can be systematically identified with a Data Catalog System?